Silver Plated Wedding Cake Stand - 18"
Rent a cake stand - An elegant and affordable way to display your wedding cake. 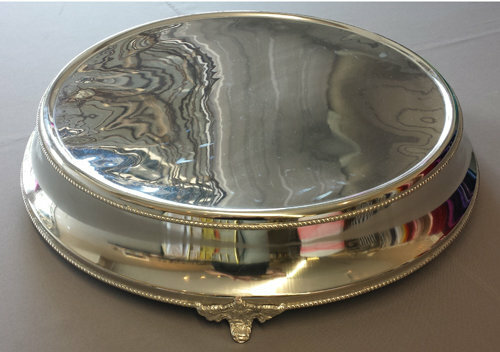 Our silver-plated wedding cake stand is 18" in diameteter with a 22 1/2" wide base and stands 4" tall on it's feet. It is accented with silver beading on the edge with an elegant design on the feet. Call today to rent for your wedding or event.